Many gardeners have an aversion to chemicals. These gardeners may be devoted to pesticide-free growing, want to plant (and eat) edibles, or simply like the thought of keeping flower beds naturally healthy. Whatever the reason, there are key steps you can take to get and keep the pesticides out of your garden. Here’s what to do. Grow on a good foundation. Healthy plants love healthy soil – soil that’s regularly changed with compost or supplemented if it’s too sandy or clayey. Have your soil tested to discover its composition and add nutrients as needed. Each spring, dig in several inches of compost, protect your plants yearly or seasonally with a healthy layer of organic mulch, and clear out any dead plant material at the growing season’s end. Match your plants to your growing climate. If you have plants that struggle and strain through the growing season, they may not be a good fit, either for the spot they’re in or for your climate. For example, sun-loving phlox may be more susceptible to wilt or mold if planted in a shady, wet location. Shrubs hardy only to USDA Zone 5 may struggle after a particularly difficult, long, and cold winter. Choose your plants carefully and site them where recommended on the plant’s label information. Be diverse. Some plants need more of a certain kind of nutrient or mineral, such as nitrogen. If you plant the same thing over and over in the same spot, you’ll deplete your soil of the very thing the plants require. You’ll also encourage nuisance bugs to take up residence – think squash bugs that overwinter in the ground and feed on the same plot of melons each year. Your yearly garden plan should include a diverse crop with a variety of flowers, vegetables, and herbs. Rotating plants helps, too. In a veggie garden, swap out spots, moving your tomatoes and peppers from year to year and skipping cucumbers if squash bugs have taken up residence. Do not assume that all bugs are bad. Just because you see a bug doesn’t mean it needs to be removed. If you spray pesticides, you may be killing helpful bugs and other garden do-gooders. In fact, some bugs actually prey on other bad bugs. For example, beetles and lizards gnaw on slugs, while ladybugs and wasps love to gorge on plant-killing aphids. If you’re not sure which bugs are good and which are bad, check with your local extension service for a guide. Inspect your plants regularly. If bugs or other pests start to make inroads into your garden, quick detection may prevent them from taking over. Regularly tour your garden, watching for discolored leaves, wilting plants, or other signs of damage. Remove weeds as they sprout so they don’t end up competing with your flowers and vegetables for nutrients and sunshine. If your garden is enduring a bad dry spell, water well and deeply at least once per week. Remove any plants that cannot be saved to stave off the spread of disease. Use barriers if you can. Not all pests are winged or creepy crawly. Raccoons, rabbits, and deer can make quick work of your garden in just a night. If you can, fence your garden beds to discourage four-legged pests. Go pesticide-free gradually. If you’ve previously relied on chemicals, you can slowly wean yourself – and your plants – from their use. Start by using one or two of the steps outlined above, such as adding in a more diverse group of plants, rotating, or including compost. Try organic sprays and remedies. There are over-the-counter remedies that are not full of chemicals and are certified organic. If your goal is a pesticide-free garden, you might consider them as a remedy for a persistent problem. 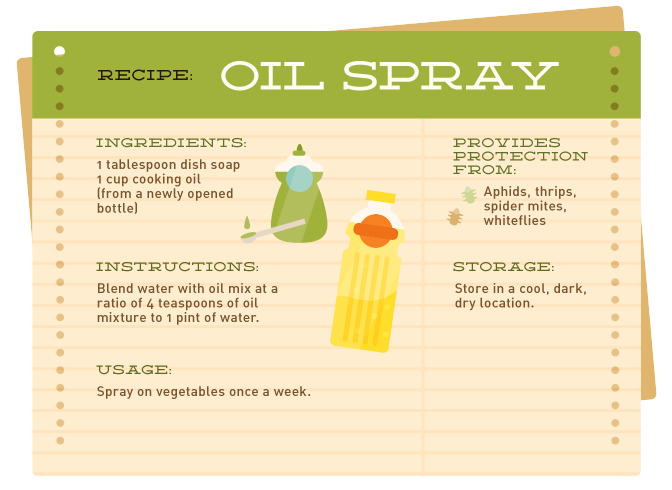 Here are some popular organic recipes for sprays. Instructions: Combine dish soap and cooking oil. Blend water with oil mix at a ratio of 4 teaspoons of oil mixture to 1 pint of water. Storage: Store in a cool, dark, dry location. Usage: Spray on vegetables once a week. 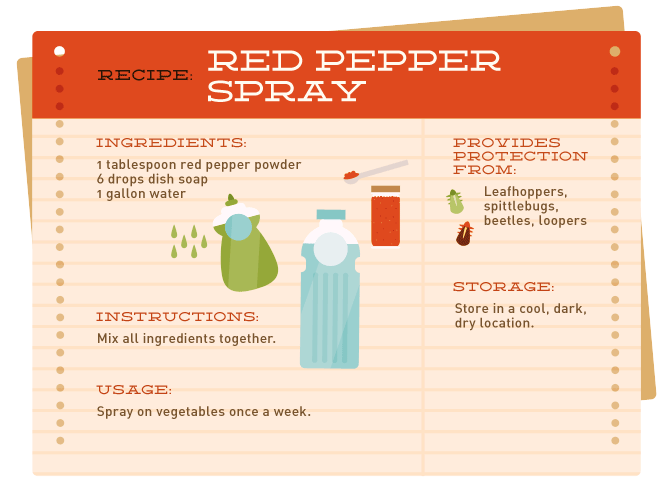 Ingredients: 1 tablespoon of red pepper powder, 6 drops of dish soap, 1 gallon of water. Instructions: Mix all ingredients together. Storage: Store in a cool, dry, dark location. Ingredients: 10 to 12 garlic cloves, 1 quart water, 1 cup cooking oil. Instructions: Using a blender, mix the garlic cloves and water. Strain through cheesecloth into a bowl. Add 1 cup cooking oil. Let the mixture stand for two days before use. Storage: Store in a refrigerator or freeze. Best if used within a week. 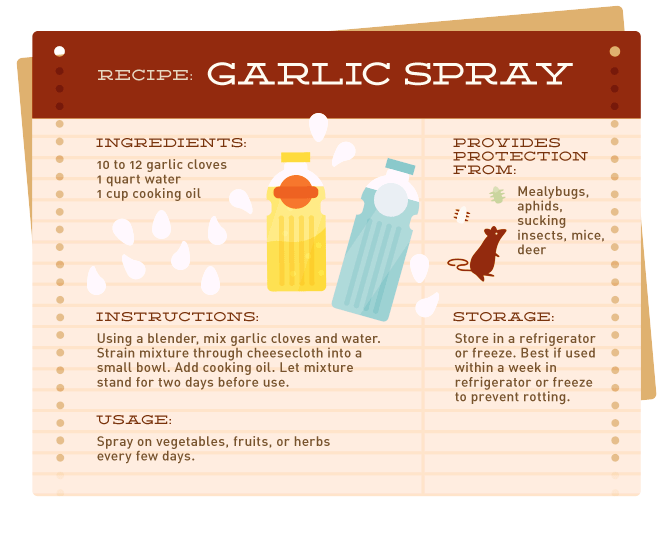 Usage: Spray on vegetables, fruits, or herbs every few days. 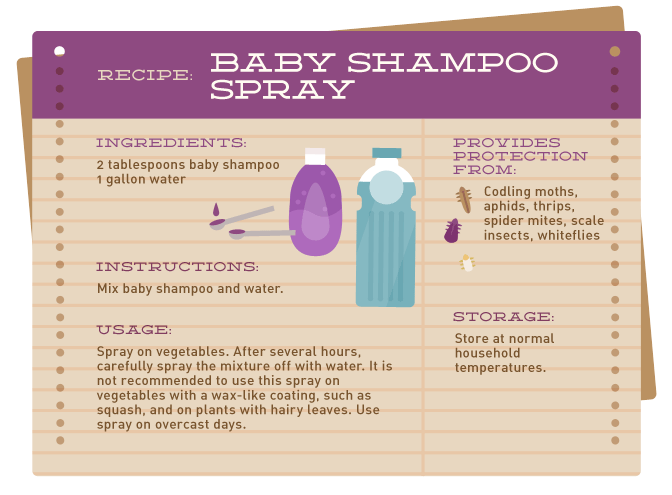 Ingredients: 2 tablespoons of baby shampoo, 1 gallon of water. Instructions: Mix baby shampoo and water. Storage: Store at normal household temperatures. Usage: Spray on vegetables. After several hours, carefully spray the mixture off with water. It is not recommended to use this spray on vegetables with a wax-like coating, such as squash, and on plants with hairy leaves. Use the spray only on overcast days. If you want to see how well your garden does without pesticides, grow and harvest these crops first, says the Environmental Working Group. What Makes Pesticides So Risky? Conventional supermarket produce may contain trace amounts of pesticide residue. In the U.S., these levels are set by the Environmental Protection Agency (EPA) and enforced by USDA and FDA inspectors. But however small these levels may be, pesticides have still been linked to various health problems; everything from nervous system issues to cancers. This is not meant to sound scary, but using pesticides at home can be extra risky because these chemicals may end up on your food in levels that are higher than what’s at the supermarket. 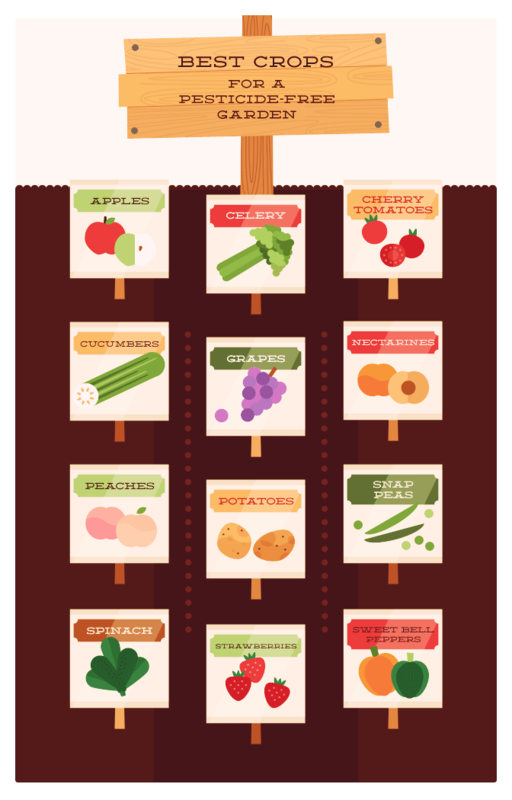 Washing your produce may help to remove residual pesticide, but some foods may retain the pesticide internally. In addition, many scientists believe that certain types of pesticides are one of the contributing factors to the increase in annual death rates of bees. Lastly, one of the benefits of growing your own food is that you have the chance to avoid using chemicals, and eat produce that supermarkets just can’t offer. Is it ok to spray the baby shampoo on oranges?